Growth plate injuries are very common in children, making up 15 to 30% of all childhood bony injuries. An adult whose bones have finished growing might simply pull a muscle or a tendon after a fall. But in a child, that same fall could injure a growth plate. How much impact a growth plate injury might have on future growth depends on the particular type of growth plate injury, which bone is injured (knee growth plates are more likely to stop growing) and how much the child still needs to grow. 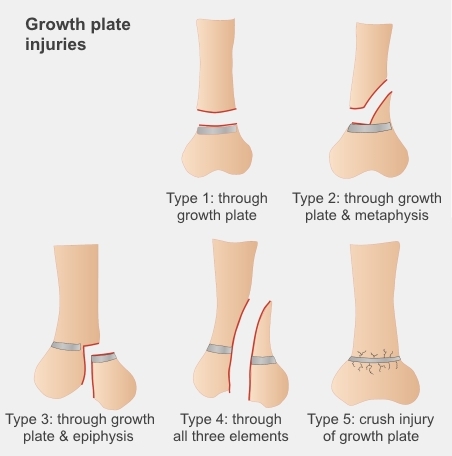 There are five different types of growth plate injuries, shown in the illustration on the right. What causes growth plate injuries? Most growth plate injuries happen from falling or twisting. They often happen during contact sports, like football or basketball, or fast-moving activities like skiing, skateboarding, sledding, or biking. They can also happen from repetitive training for activities like gymnastics, track and field, or pitching a baseball. Less common causes of growth plate injuries include exposure to extreme cold, medical conditions that affect bone growth (such as infection, tumours, and vitamin deficiencies), and medicines that can affect bone growth (such as treatments for arthritis or cancer). How do I know if my child has a growth plate injury? If you think your child has injured a bone, it is important to seek treatment. The doctor or nurse you see will ask you questions about your child's injury, and examine their arm or leg. Most growth plate injuries are diagnosed from X-rays. But because growth plate injuries can be difficult to see on X-ray, your doctor may X-ray both arms or both legs for comparison. Often the joint above and below the growth plate will also be X-rayed, to make sure there are no other injuries. Very occasionally, a child might need extra imaging such as a CT, or MRI scan. On the next page: How are growth plate injuries treated?